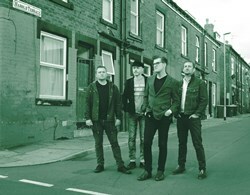 The Smyths formed in 2003 are the leading Smiths tribute band in the country and played a solid hit packed set to a capacity crowd in The Flowerpot. Highlights of the first set included Shakespeares Sister, Shoplifters Of The World Unite, Hand In Glove, That Joke Isn't Funny Anymore, Unloveable and The Boy With The Thorn In His Side. This set closed with the stunning How Soon Is Now? This was far too early in the set but a fantastic version nevertheless. The second set was kicked off with Headmaster Ritual and Heaven Knows.I'm Miserable Now. The pick of this set included Miserable Lie, Handsome Devil, Ask, Still Ill, Bigmouth Strikes Again, What Difference Does It Make? and ended with the classic This Charming Man. The band returned and played Barbarism begins At Home as the encore. 'Morrissey' and 'Johnny Marr' looked like the real deal and in true Smiths style there was very little interaction with the audience and when 'Morrissey' spoke, he mumbled. Watching a tribute band as good as these shows just how good the real deal were as songwriters and their legacy lives on just as much for those who were there when it happened as well as giving the newer converts a taste as to what it was like.